Levi Seiler of Wauseon drives on Josh Vance of Swanton during Friday night’s NWOAL contest. The Indians overcame a second half deficit to win, 54-43. Connar Penrod of Wauseon handles the ball versus Swanton Friday night. 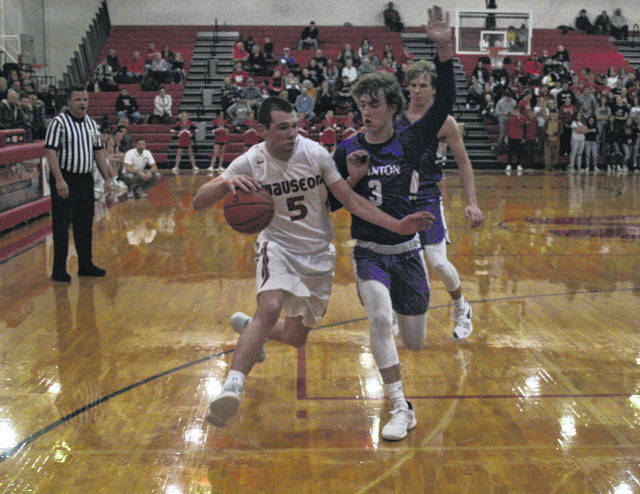 In a dogfight for much of the game, Wauseon picked their game up midway through the third quarter and into the fourth, going on a 12-2 run in what ultimately resulted in a 54-43 home win over Swanton in Northwest Ohio Athletic League boys basketball Friday. Both teams added wins on Saturday as Wauseon held off Springfield on the road 60-59, and the Bulldogs took down Lake at home 45-28. “I’ll tell you what, they are tough,” said Wauseon coach Chad Burt of the visiting Bulldogs. “If you’ve seen Swanton’s scores recently, you know they are playing very, very good basketball. (Could have) beat Evergreen, I believe that was two weeks ago. Could have beat Genoa (last) Saturday. Swanton gained momentum at the half when Josh Vance buried a three-pointer from the corner as the halftime horn sounded, putting them down a point, 28-27, heading into the locker room. They carried that over to the third period. Andrew Thornton gave the Bulldogs the lead 16 seconds in with a three, however, Noah Tester answered with a triple for the Indians. Randy Slink scored inside for Swanton, plus a pair of free throws by Jared Wilson gave the Dogs a 34-31 lead with six minutes left in period. The Indians would take over from there. Trent Armstrong converted a steal into two points, Sean Brock scored inside for the Indians, and Armstrong scored on another fast break opportunity. Following a Thornton triple for the Dogs, a Brock layup and two free throws for Armstrong put the Indians up 41-36 after three. Wauseon switched up its defenses in the second half, using various zone schemes to help slow down the Dogs. Levi Seiler notched a pair of hoops for Wauseon in the first two minutes of the fourth around Wilson’s two free throws for Swanton, bumping their lead to seven points. A Wilson triple pulled the Dogs within 45-41, but the Indians responded with four points from Seiler, plus hoops by Connar Penrod and Armstrong for a 53-41 lead with just 2:24 to go. “They kind of wore us down with some screening action,” said Bulldog mentor Joel Visser. “Really going to their guys. I mean outside of Seiler and Armstrong, they didn’t even look to really shoot the ball. I should have made some adjustments to do a little doubling on the block. Do some things differently. But, we felt good about our matchups against their two guys. Give them a lot of credit. Armstrong and Seiler played tough down the stretch. The first half was a back-and-forth contest with Swanton leading after the first quarter, 16-15, following a Slink putback. The score was knotted at 17 a little over two minutes into the second quarter, then Slink put the Dogs on top with a jumper. After a Jonas Tester hoop for the Indians, Wilson nailed a three to give the Dogs the lead near the three minute mark. Seiler then got two hoops for the Indians around an Armstrong triple, putting Wauseon in front 26-22 with 1:15 left until halftime. That four-point difference held until Vance’s buzzer-beating three. 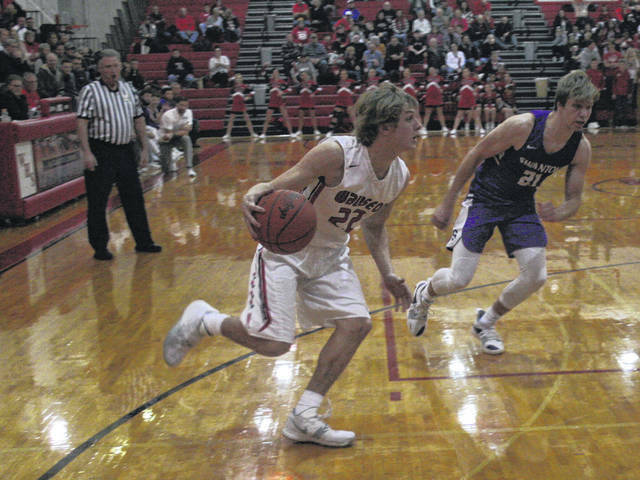 Seiler led the Indians with 18 points. Wilson had 16 for the Dogs. Wauseon (14-3, 3-1 NWOAL) is at Evergreen (14-2, 4-0) this Friday and Elmwood (11-5) on Saturday. Swanton (7-10, 1-3) hosts Liberty Center (5-9, 1-3) in league play Friday.